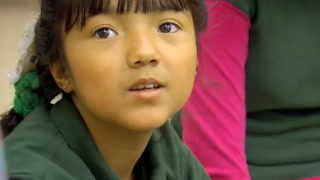 Why are sentence frames an effective strategy for English Language Learners? How do sentence frames empower students? How can you adapt these sentence frames for use in your own classroom? I am Kathy Iliev, and I teach English Learners in grades K through 5 in the Juneau School District. I work between two different elementary schools, serving a range of students from various cultural backgrounds. This is my sixth year in the position, having previously taught Talent Enrichment Development. The video I chose was Language Supports for Number Talks. I chose this video because of the populatoin I serve. For many EL's, the sentence stems are a great way for them to participate in discussion where they might otherwise remain silent. The practice of the frames through reading, speaking, and applying, allows EL's to make their ideas accessible to others. Many do not have the language, and the frames are a great support. Besides writing them on strips, I have also seen conversaton placemats that students have available to them during discussion. 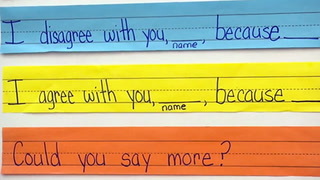 Sentence frames allow for students to figure out what to say. This is a get tool for ELL's who may not know how to form their questions. What a great idea with sentence frames. Where do you find the "supporting materials" referred to by Gretchen earlier? I'm looking for the full set of sentence frames. Great process to help students who have a hard time asking a question because they don't know how to state it. Monique LaCour: I'd like everybody to choose their favorite Sentence Frame, and let's go ahead and see which ones you guys like the best, that you'd like to try today as a whole. Monique LaCour: Sentence Frames are really, really crucial both to the Number Talk and to the academic conversation. The Sentence Frames are ways that the students can ask for help, build on one another's ideas, change their minds, and it really gives them freedom. Monique LaCour: Raise your hand if you see a good way that you could say if you need some help. 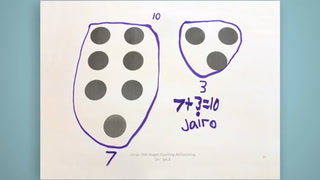 There are a couple there that can help you if you need some help in a Number Talk. Student: Like if someone says a little bit then you can tell them, "Can you say more?" Student: Can you say more, because I'm not really understanding you. Student: Yesterday in my group, somebody said, "Could you say more?" so they could understand the way that somebody was sharing their idea. Student: Can you say more, because I'm not understanding you. Monique LaCour: I know you're facilitator, how did you think that that worked for the group? Student: Good, so everybody could understand. Monique LaCour: So we practiced the Sentence Frames as a way to really support respectful, compassionate and highly academic conversation, and really come to a place of collegiality, even in second grade. Monique LaCour: Anybody see another Sentence Frame that helps if you're not understanding? Angel, do you see? What do you think? Monique LaCour: Okay, raise your hand if you might have a question you think you could use that Sentence Frame. Let's try it together. 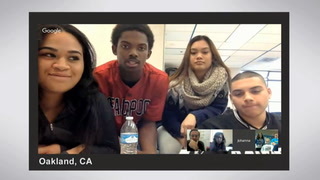 "I--"
Monique LaCour: Particularly at Acorn Woodland, and in many populations of students who are English Learners, if you don't know the right way to say it, you might not want to say anything at all. Every way that we can give English Learners a foothold into the conversation, it's gonna enrich not only their learning, but all the people around them. Monique LaCour: I heard you change your mind, Ernesto. And I'd love for you to use the Sentence Frame that helps us to explain that to our team. Ernesto: I would like to realize the thinking. It's not 88, it's 58. Monique LaCour: Those Sentence Frames, they're so empowering. Students are using vocabulary that really will left them up, you know, and it will be something they can build on for the rest of their educational careers. Student: You might try using a Sentence Frame. Student: I would like to defend the answer. Monique LaCour: To support a student who would be so worried to share an idea, to be able to support them reading the sentence frame, and then to be able to say it, and then to know when to apply it, suddenly, their ideas are accessible to everyone. And they feel like a part of the learning community.